Babblings of a Mommy: My Fav Make-Up Brushes. 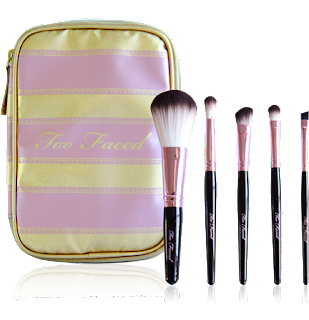 Too Faced has some great products out there, but hands down my favorite is their Teddy Bear Brush Set! They're UNBELIEVABLY soft and are made out of the finest synthetic materials. They're made to feel like real animal hair (hence the name "teddy bear" ) without the cruelty involved in making real animal brushes. 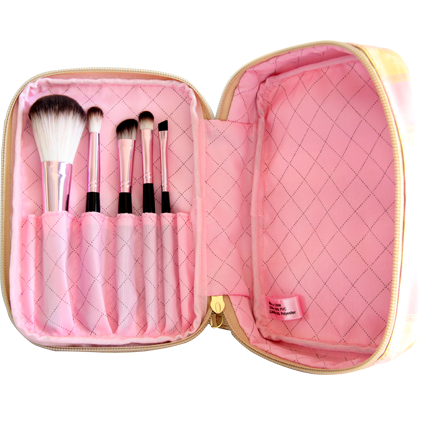 Ladies, you've got to try them--besides being adorably cute (and coming in this pretty little case), and aside from being silky smooth, they also work wonderfully! They make your make-up go on flawlessly and make blending eyeshadows a cinch! At $65 they're an investment, but they're definitely worth while and will last you a lifetime. Also remember to wash your brushes every month with baby shampoo to keep them nice and clean. You can get them at toofaced.com, Sephora, or wherever Too Faced is sold. I like MAC brushes too, but I only buy them during Christmas when they sell an entire set for a bargain. I also like Bobby Brown brushes if I have the cash, and Target's brushes actually aren't that bad. Thanks for the tip! I've never used Bobby Brown brushes, I'll look them up next time. Thanks! Ecotools bamboo set are good too if you're looking for a bargain.